John Byron Nelson Jr. (February 4, 1912 – September 26, 2006) was an American professional golfer between 1935 and 1946, widely considered one of the greatest golfers of both his generation and of all time. Born near Waxahachie, Texas, Byron Nelson was the son of Madge Allen Nelson and John Byron Nelson Sr. His parents set a precedent for him not only in their long lives — Madge Nelson lived to age 98, and her husband to age 77 — but also in their religious commitment. Madge, who had grown up Baptist, was baptized in the Church of Christ at age 18, and John Byron Sr., raised Presbyterian, was baptized in the Church of Christ soon after meeting Madge. The senior Byron Nelson went on to serve as an elder in the Roanoke Church of Christ, and the younger Byron Nelson was a committed member of that congregation — even performing janitorial services there from time to time long after he became famous – he later placed his membership at the Hilltop Church of Christ in Roanoke from 1989 until 2000, when he moved his membership to the Richland Hills Church of Christ in North Richland Hills, Texas in later life. When Nelson was 11 years old, the family moved to Fort Worth, where he barely survived typhoid fever after losing nearly half his body weight to the disease, which also left him unable to sire children. Soon after his baptism at age 12, he started caddying at Glen Garden Country Club. On his caddying days, Nelson said, "I knew nothing about caddying at first, but it wasn't difficult to learn. The other caddies, though, didn't like to see any new ones, because that might mean they wouldn't get a job sometime." An article on Nelson in Sports Illustrated noted that initially caddies were not permitted to play at the club: "[H]e would often practice in the dark, putting his white handkerchief over the hole so he could find it in the darkness." The club later changed its policy and sponsored a caddie tournament, where a 14-year-old Nelson beat fellow caddie and future golf great Ben Hogan by a single stroke after a nine-hole playoff. Nelson and Hogan were rivals but close friends in their teen years, and for the first part of their professional careers as well, but Nelson's early success was difficult for the struggling Hogan to deal with, and they gradually grew apart, while retaining mutual respect. Nelson's record of 113 consecutive cuts made is second only to Tiger Woods' 142. The PGA Tour defines a "cut" as receiving a paycheck, even if an event has no cut per se. In Nelson's era, only the top 20 in a tournament received a check. In reality, Nelson's "113 consecutive cuts made" are representative of his unequaled 113 consecutive top 20 tournament finishes. Almost half of those top 20s were during the weakened tour war years of 1944 & 1945. In fact, 26 of Nelson's 52 tour wins were during those two weakened tour years of 1944 & 1945. Before 1944 he had never won more than 4 events in any year. Nelson retired officially at the relatively early age of 34 to be a rancher, later becoming a commentator and lending his name to the Byron Nelson Golf Classic, the first PGA Tour event to be named for a professional golfer. As a former Masters champion he continued to play in that annual tournament, placing in the top-10 six times between 1947 and 1955, and as high as 15th in 1965. From 1947 to 1955 Nelson played in 12 majors and won none. During that same time frame Ben Hogan played in just 19 majors and won 8. In Jack Nicklaus's 1978 book On and Off the Fairway, Nicklaus wrote that Nelson was the straightest golfer he ever saw. The two never played competitively, but a 14-year-old Nicklaus was in the crowd at the 1954 U.S. Junior Amateur, when Nelson gave an exhibition hitting golf shots. ^ a b c Anderson, Dave (June 27, 2007). "An honor for Byron Nelson, Golf's patron saint". New York Times. Retrieved June 1, 2016. ^ Kelley, Brent. 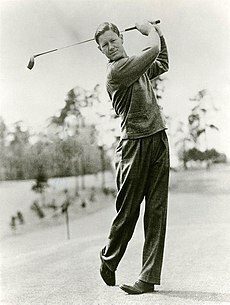 "Ben Hogan". About.com. Retrieved May 25, 2007. ^ Kelley, Brent. "Sam Snead". About.com. Retrieved May 25, 2007. ^ a b "Byron Nelson profile". World Golf Hall of Fame. Retrieved January 16, 2014. ^ a b c d Ross, Bobby Jr. "Legendary golfer Byron Nelson, a faithful church member, dies at 94". The Christian Chronicle. Archived from the original on 2007-10-24. ^ Apfelbaum, Jim, ed. (2007). The Gigantic Book of Golf Quotations. World Golf Hall of Fame. ISBN 978-1-60239-014-0. ^ a b Stricklin, Art (September 26, 2006). "Grace, style and morality: Nelson will be known as 'legend who will never fade'". Sports Illustrated. Retrieved November 2, 2006. ^ a b Dodson, James (2004). Ben Hogan: An American Life. Doubleday. ISBN 978-0-385-50312-9. ^ a b Barkow, Al (1985). Gettin' to the Dance Floor: An Oral History of American Golf. Atheneum. ISBN 978-0689115172. ^ Kessler, Peter. "Golf's great gentleman looks back – and ahead". Golf Magazine. Archived from the original on September 27, 2007. Retrieved May 22, 2007. ^ Townsend, Brad. "A course for success". The Dallas Morning News. Archived from the original on November 3, 2006. Retrieved May 22, 2007. ^ Nelson, Byron (1993). How I Played the Game. Taylor Trade Publishing. ISBN 978-0-87833-819-1. ^ "Tales from the Bunker" Harold "Jug" McSpaden – The Other "Gold Dust Twin"". September 5, 2011. Archived from the original on January 13, 2014. ^ a b c d e Kelley, Brent. "Byron Nelson". About.com. Retrieved May 18, 2007. ^ a b c d Kelley, Brent. "Top 10 Individual Seasons in Men's Golf History". About.com. Retrieved May 21, 2007. ^ a b Smith, Jeff (September 29, 2006). "Byron Nelson". The Sand Trap. Archived from the original on October 15, 2008. Retrieved May 22, 2007. ^ Nelson, Byron (1993). How I Played the Game. Dallas, Texas: Taylor Publishing Company. pp. 221–247. ISBN 0-87833-819-5. ^ a b Goldstein, Richard (September 26, 2006). "Byron Nelson, Golf Champion, Is Dead at 94". The New York Times. Retrieved November 1, 2006. ^ Townsend, Brad; Nichols, Bill (September 27, 2006). "Byron Nelson: Golf's legend, par excellence". The Dallas Morning News. Archived from the original on February 6, 2007. ^ "American Golf Legend Nelson Dies". BBC Sport. September 26, 2006. Archived from the original on May 13, 2012. ^ Albers, Bucky (September 27, 2006). "Dayton was Byron Nelson's 2nd home". Dayton Daily News. Archived from the original on September 30, 2007. ^ Rude, Jeff. "Legendary memories: Byron Nelson was larger than life, and I was lucky to call him a friend". Golf Week. Archived from the original on October 31, 2006. ^ Celizic, Mike (October 3, 2006). "Death of Nelson shuts door on greatest era: 'Lord Byron' embodied the essence of the game like no one else". MSNBC. Archived from the original on October 31, 2006. Retrieved November 2, 2006. ^ Yocom, Guy (July 2000). "50 Greatest Golfers of All Time: And What They Taught Us". Golf Digest. Archived from the original on 2007-12-17. Retrieved 2007-12-05. ^ The Golf Book'. Sports Illustrated. 2009. p. 147. ISBN 978-1603200851. ^ Nicklaus, Jack; Bowden, Ken (1978). On and Off the Fairway. Simon and Schuster. ASIN B003LA89N6. ^ "A Look at Northwest ISD's Second High School". Archived from the original on November 26, 2010. Retrieved May 19, 2007. ^ Barkow, Al (1989). The History of the PGA TOUR. Doubleday. p. 263. ISBN 0-385-26145-4.